After many long months of waiting for full Hebrew support on the Android mobile operating system, Android development at RustyBrick is now in full swing. The latest version 2.2 of Android, called Froyo, includes the Hebrew font pack and some other RTL languages. This will allow us to develop our feature rich apps using the native Hebrew font. Before this Android update, it was still possible to use Hebrew text in most UI elements except the Webview control, a very important control in our popular Siddur app. Ronnie explained in his experience programming our Shabbat Times App (available free, now). Or, if you have root access on your phone, you could install the full Hebrew font yourself. 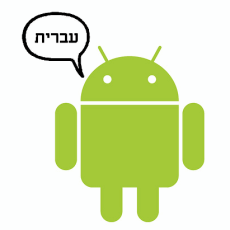 Please note that in most cases, the new native Hebrew apps will only be supported in Android version 2.2 and up. To support our development of Android apps, RustyBrick recently gathered up a variety of new Android phones as shown in the picture. From left to right: iPod Touch, iPhone 2G, iPhone 4, HTC myTouch 3G, Motorola Droid 2, Motorola XT720, HTC Incredible. Top: another iPhone 4. 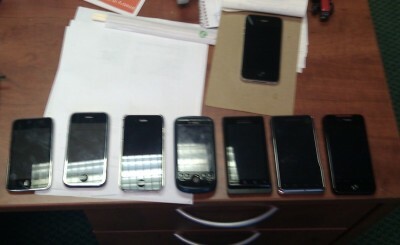 Other Android phones in the office: Nexus One, Droid 1, Samsung Moment, Droid Eris. RustyBrick is now hiring developers. See our postings for Android developer, iPhone developer, and PHP/MySQL developer.